The Liverpool squad are staying positive in the Premier League title race, despite being held to back-to-back draws by Leicester and West Ham in the past week. The Reds have only failed to win six times in 25 games in the English top flight this season, but three of those have come in 2019: two draws and a loss. 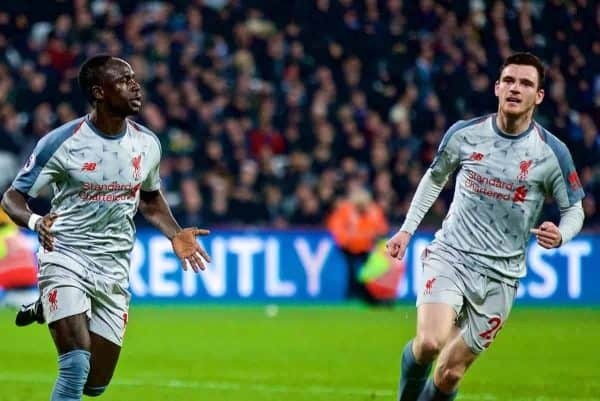 Given a big opportunity to push further away from Man City at the top of the table, Liverpool instead drew 1-1 with both the Foxes and the Hammers, and a win for the champions against Everton on Wednesday night will see them move ahead on goal difference. But while the mood around Anfield has soured given these results, one key word has continued to emerge in the players’ assessments of their situation: enjoyment. “Concerned being top of the league in February? No, I’m happy!” came James Milner‘s brilliant response when asked whether dropping points was worrying. “Playing for relegation and livelihoods and people’s jobs, that’s pressure,” he told Goal. “I’ve been fortunate enough to win titles, I’ve been unfortunate enough to get relegated as well. I’ve experienced it, and these are the times you should be enjoying. “We’re still top of the league, obviously we’ve made it hard for ourselves,” he explained. 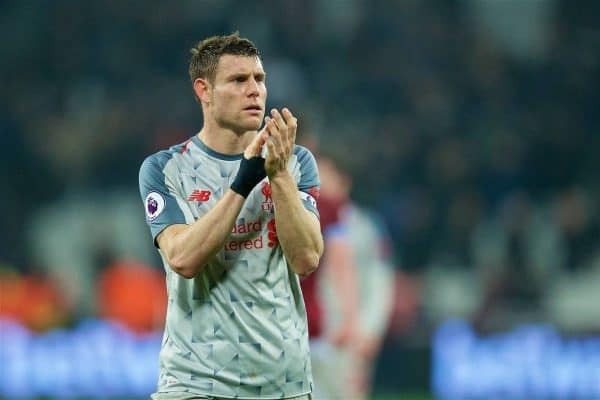 Andy Robertson said similar when speaking in the mixed zone at the London Stadium, and joined Milner in delivering a message to supporters, whose anxiety was palpable, according to West Ham captain Mark Noble. “A lot of people talk about pressure because we’ve not been in this position, but it’s February,” the left-back insisted. “I think everyone needs to try and relax, enjoy the run-in if you’re fans or if you’re a spectator from another club or whatever you can watch. Jurgen Klopp himself, speaking to BBC Sport, identifying a lack of enjoyment in Liverpool’s game in east London as a key factor behind the draw. “I didn’t see whatever you could ask in the next few questions, about pressure or stuff like that,” he said. It has seemingly been lost of late, in the clamour for a first Premier League title, that the Reds’ pursuit should be savoured, rather than laboured. While it may prove difficult to enjoy every game between now and the end of May, it is worthwhile noting that never before have Liverpool been in such a strong position at this stage of the campaign. And though silverware may be a tangible marker of success, the journey should be just as important for fans.